Get ready for the parade, the floats and all the Mardi Gras beads! Our friendly crawfish is ready to get some beads from the celebration and would make a great activity for your Mardi Gras party or as a supplemental activity in the classroom. The colors for Mardi Gras are purple, green and gold (yellow). 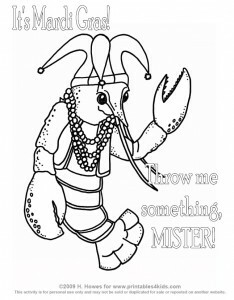 Click on the image above to view and print full size or you can download our Mardi Gras Coloring Page as a PDF file. Want more Mardi Gras fun? Visit FantasyJr. for some colorful, printable Mardi Gras masks. And if you are having a Mardi Gras party, Save 10% on Mardi Gras Party Supplies from Shindigz.